For me emotionally, today was better than yesterday, which was better than the day before. For Anna, whose only goal is to forget about this whole experience, time passing is helping her move on. That scares me, because I need to get her in to talk to someone who knows how to help her deal with this. And to assuage her feelings of guilt. Yes, guilt. She thinks that because it was her idea to ride bikes to the farmers market, it’s her fault that her brother got hit by a car. She also said, “I wish I had been the one hit by the car so my brother’s leg wouldn’t hurt so bad.” Um, you’re five. You’re too young to assume so much responsibility and guilt! So yeah, counseling. Soon. Our friends came over to visit, and they had this awesome little car. Eric loved getting pushed around on it, so we got out the wagon as well. His little friend Leif was loving pulling him up and down the block. Eric is getting a lot of attention from his friends, which of course he just loves! Eric’s road rash is healing with no infection. His leg is so bruised up and swollen that he won’t walk on it, but his doctor doesn’t think there will be any long-term damage. She sent us over to the fracture clinic at Kaiser, to see if they could come up with something to give him some confidence to try walking. They outfitted him with this awesome leg wrap/brace thing, and the guy there was so funny and awesome, he had the kids laughing. laughing is better than crying! 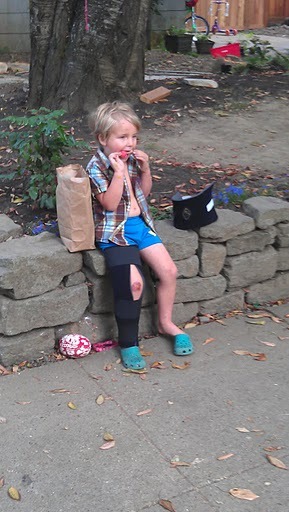 Eric still won’t try walk, but the wrappy thing keeps the wound protected. I think anything touching it is so painful, he was really getting stressed out. This gives him a little peace. The guy who fitted him with it said it might be this weekend before he feels like walking, and that’s ok. It’s such a relief to know that it’s going to be ok, and I just need to let him heal. I rode my bike to work today, because I don’t want to be afraid to ride, and because it’s the Bike Commute Challenge, and because it’s good exercise. But I was freaked out riding in to work, and had an actual anxiety attack before riding home. I usually ride down the side of Hwy 26, which is a fast, exhilarating rocket ride down the hill. I just couldn’t do it, though — I was too worried about crashing and being covered in road rash. Thankfully, MAX was there for me so I rode it most of the way home. I only have to go to the Metro Regional Center tomorrow, and it’s only about 4 miles away so I think it will be a better “getting my feet wet” ride than all the way to the zoo and back. We’re making progress, slowly but surely! I’m haunted by my own screams today. A few times an hour, I’m running across that street again, a primal noise unlike any I’ve ever made coming out of me. My screaming had some benefit — it got the driver’s attention and it alerted everyone around to pay attention and call 911. It all comes back to me, at least twice an hour. I haven’t timed it of course, but that’s my estimate. It all starts with the sound of my screaming in my own head. I’ve never screamed like that before, and I hope I never have to again. But the sound keeps reverberating in my head when I least expect it. Sometimes I sob and sob if I let myself be in that moment again. Sometimes I push it down. I know it’s good to cry and let it out, but it doesn’t really leave (so why is it called “letting it out?”) and I just can’t cry all the time any way. I can only imagine what Anna was thinking when she heard me screaming. I’ve tried to get her to talk about it, but I don’t know how to draw her out. She says she wants to forget about it all. I wish I could, but I know none of us can (I am seeking professional help for all of us, BTW). She asked me why I won’t be able to forget, and we talked about how I also can’t forget the time when she was about a year and half old, and she fell down all 16 of our hardwood stairs. I yelled, “ANNA ANNA ANNA ANNA ANNA ANNA!” as she tumbled down, me trying to catch up to her, wishing my voice would wrap around her little body and stop her fall. I think the force of my screams stopped that car on Saturday, and kept it from killing my son. I just wish they’d stop replaying in my head. I’m a mess. I keep crying randomly. And different things pop in to my head, like, “his little body was dragged on the pavement…” or, “I shouldn’t have been so far in front of him…” and I just lose it. I just can’t express enough how grateful I am that he’s not more seriously hurt. I really believe an angel must have been wrapped around him. When I think about how close I came to losing Eric, I can’t even breathe. I honestly don’t know how a parent recovers from losing a child. I know they do, I know it’s possible, but it’s inconceivable at this point. No no no no no. Maybe he wasn’t out there.No, he just passed me, he was out there. Maybe there’s another landing below our balcony, and he landed on that. No, I don’t think there was. Is there any way a human being could survive a fall from a 5th floor balcony? Maybe a miracle kept him alive? If I look over the edge, will he be laying on the ground way down there? Maybe he wasn’t out there. I made it to the balcony, and he was in the corner, obscured by the curtain from inside. The THUNK was him falling off his chair into the wall of our room. We got both kids back inside, and Brian and I looked at each other, shaking our heads. I’m shaking my head now. That terror of what might have been has haunted me since March. I had a hard time even writing about the conference, because I kept thinking about what almost happened to Eric. Whenever I think about that balcony incident, I have a visceral reaction. I shake my head and put my hands in front of my face, and take a step backward. Brian is similarly haunted by a time he took the kids hiking, and Eric fell off a cliff. He doesn’t know what happened exactly, just that one second he noticed Eric was losing his balance, and the next second he was on the ground, holding on to Eric’s jacket in one hand, and his t-shirt in the other, and sliding down the hill himself, grabbing for an arm. Fortunately neither of them were hurt, and they got back on the trail. I hope you never have to experience what I did yesterday. I watched my little three year old boy get hit by a car. We were riding our bikes to the farmers market, crossing a street in the crosswalk. 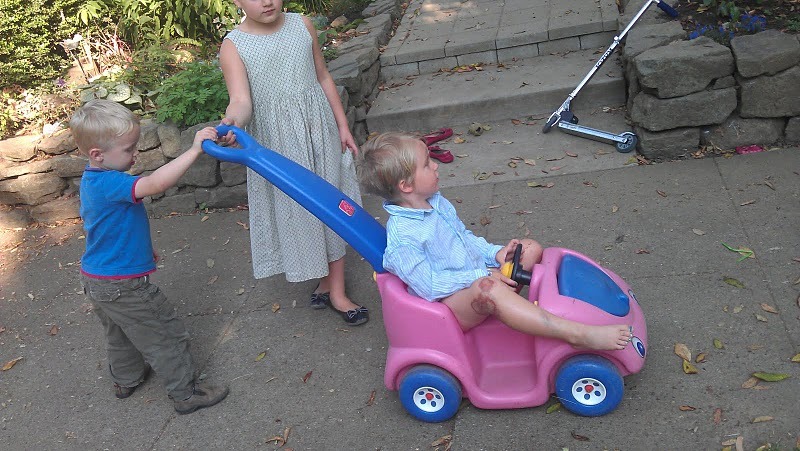 I always pull in to the middle of the street, then wait for both kids to cross the street. Anna was in front of me, and I think I went a little further than the middle of the street before stopping to wait for Eric. I don’t know why, I think I either thought he was closer behind me, or I felt safe since we were crossing at a crosswalk and the light was with us. In any case, I stopped about halfway through the adjacent lane, and looked back to wait for Eric. I saw the car start to turn in to the cross walk, right where Eric was riding. I’m shaking my head no no no even as I type this. I started screaming “NO WAIT STOP NO NO!” but he kept right on turning. In that flash of an instant, it occurred to me that all of my fears as a parent were coming true right then. I see Eric get pulled down, but then I can’t see him any more, and I’m running and screaming at the top of my lungs. The car finally stops, and Eric is pinned under his bike, the back tire of the bike is under the car’s front tire. I can’t get him out, I bang on the hood of the car and scream BACK UP BACK UP BACK UP! I’m a little fuzzy at this point. I’m not sure when I stopped screaming, but I think it’s when it sunk in that Eric was also screaming, and moving all of his limbs. I stood there, holding my screaming boy, not sure what to do next. We were surrounded by dozens of people who had either seen it happen or heard me screaming. Some kind soul helps me sit on the curb, and Eric is just frantic and writhing and screaming in my arms. I’m talking to him, reassuring him, and I can hear that someone is on the phone and that help is on the way. I make eye contact with a woman, “My daughter! My daughter is over there!” Thank you, woman who retrieved Anna. Thank you, quick 911 caller, thank you people who helped me sit down. It breaks my heart to remember Anna’s little face when she came around the car. She looked so scared, like she wanted to cry but she didn’t, she was trying to be brave. The rest of the day I go back and forth from feeling badly that it took me that long (a minute, maybe two? an hour? 3 seconds? who knows) to send someone for her, to being impressed that I even remembered that she was there. Poor little thing. Matilda the bank manager at the U.S. Bank on the corner brings us water. I make us all drink some, thinking, “this will keep us from going in to shock.” Not sure why that occurred to me, and if that would even help, but at the time that’s what I thought. She also brought a wet little towelette to cover Eric’s legs, so he wouldn’t see the blood. Thank you for your thoughtfulness, Matilda the bank manager. The police arrive first and start collecting information, followed closely by the ambulance. I ask about our bikes, which someone has retrieved from the middle of the street. Thank you. I’m still holding Eric sitting on the curb, and Tess and Wendi the EMTs are inspecting Eric. A bystander leans over to me and asks if there is anyone else he can call for me, so I have him call Brian. Thank you, bystander man. Tess and Wendi put a neck brace on Eric, which he really thinks is a bad idea. They don’t think there’s anything seriously broken, but of course we have to check it all out. I see the driver, hanging back and looking anxious. 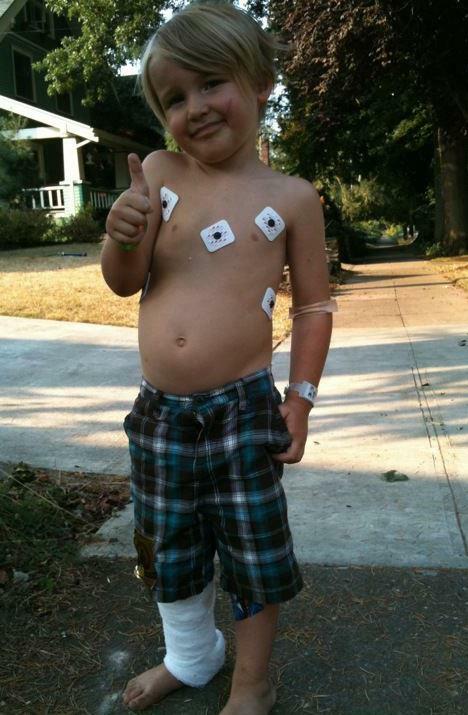 I give him a thumbs up and mouth, “They think he’s OK.” I thought he was going to collapse. Bank manager Matilda assures me that the bikes are all safely in the bank, and offers to hold the helmets for us as well. Eric is being loaded in the ambulance, and I turn to the driver. I’m not sure why, but we hug, and I start crying. I think he was too, or close to it. I’m crying, “I should have had him closer to me.” And he says, no no no, don’t say that. I realize Anna is right behind me, and I say, “I can’t cry now, I have to pull it together, I can’t lose it yet.” Anna and I get in to the ambulance, and Eric hasn’t stopped screaming this whole time. Driver man asks me to let him know how Eric is later, then the doors close while Tess & Wendy give Eric an IV and attach EKG stickers.”Is that just in case?” I ask. 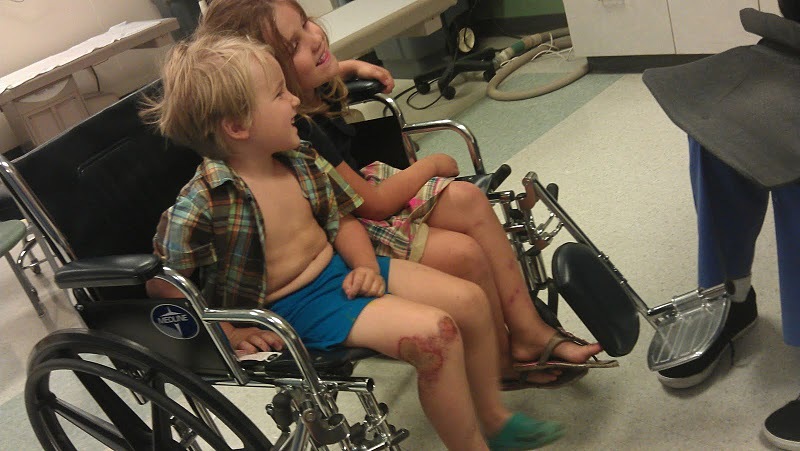 They answer, “We don’t think there are any internal injuries, but kids are fine until they’re not. So we’re setting it all up in case we need it, because if he’s not fine, we need to be ready.” Please be fine. Thank you, Tess and Wendi. On the way to the hospital, Tess is asking Eric questions while she takes his blood pressure. “I do like dinosaurs.” Eric’s screaming has decreased in intensity. Finally, Tess is done doing whatever and lets me near his head. I’m kissing him, and we’re talking, and he’s finally down to a whimper. “I just want to go home,” he says. Yeah baby, me too. “I think we should just walk to the farmers market next time.” OK baby. “My whole body hurts.” I know baby. I’m sorry. Roughly 10 doctors and nurses and what have you are waiting in trauma room 1 at Emanuel. They seem to absorb Eric like an amoeba, surrounding him, and I see a lot of rapid activity. I know he’s safe, and I almost collapse. A kind social worker introduces herself as Jill and hands Anna a bag of activities and toys. I tell her that Brian should be there, and needs to get in, and that Anna needs food, as we were planning on eating breakfast burritos at the farmers market. Anna gets graham crackers and orange juice, and Brian is brought in. Thank you, Jill and the trauma responders. My parents are on the way, and Jill tells me some friends are here. “My parents?” No, they said they are friends. It’s Shannon and Charles. Tessa offers to go give them an update, and Eric & Brian are going in for x-rays and CT scans. They’re all clear. No internal damage. Probably no broken bones, but they can’t really tell with kids. Significant road rash, but we can go home. Brian has to take his truck back to work, so I go back in to solution mode. Brian will go finish up work. I send Anna with my parents to get some food. I ask Shannon and Charles to go to our house to get my car. Thank you, Mom & Dad. Thank you, Shannon & Charles. Once all that is arranged, I go in to the bathroom and fall apart. I’m crying so hard, it feels like my insides are melting. I realize I’m on a bathroom floor in a hospital, and that Dayl would say that’s not clean, so I get up and wash my hands, wishing Dayl was there with me. Before long, we’re at home. Shaken and traumatized. But whole. I hesitate to define us as “OK,” when we’re not OK. Nobody died, but we’re not OK.
It’s taken me 3 hours to write this post, because I keep crying, and I’m trying to help the kids deal with the after effects as well. Anna is making everyone cards to help us feel better. Eric can’t walk, his leg is so swollen. I have to change his bandages again, but he hurts so much, and I can’t bear it that I’m causing him more pain, even though the ministrations are really making it better. We’re not in very good shape over here today, but it could have been so much worse. And for that I am nothing but grateful. PS: thank you, Eric, for not dying and for being so tough! Thank you, Anna, for being so brave and caring! Here come the head lice? Wow! Anna starts kindergarten tomorrow, and just look at all this crazy paperwork! Some of these multi-page documents aren’t even double-sided. And you call yourselves Oregonians? Ok, I’m being a little harsh on the paperwork. We all do our best, right? It’s all good information. What really got to me, though, are the 3 pages devoted to pediculosis, head lice. I really sincerely hope we won’t have to deal with this… But we will, won’t we? Tell me, parents of the world… is it inevitable? Shut the front door! This is a big enough problem that they devoted 3 pages to it? Help!